Several months ago, my friend's mom sent him home with a little bag of vintage goodies to pass along to me (something that has happened more than once and has been awesome every time...thank you, Cyd!). 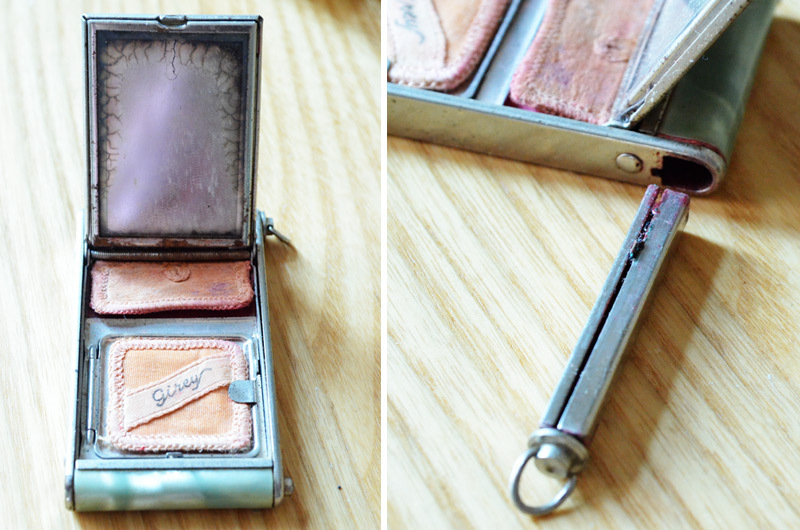 And inside, amid some lovely linens, was this beautiful old compact that I immediately fell in love with. 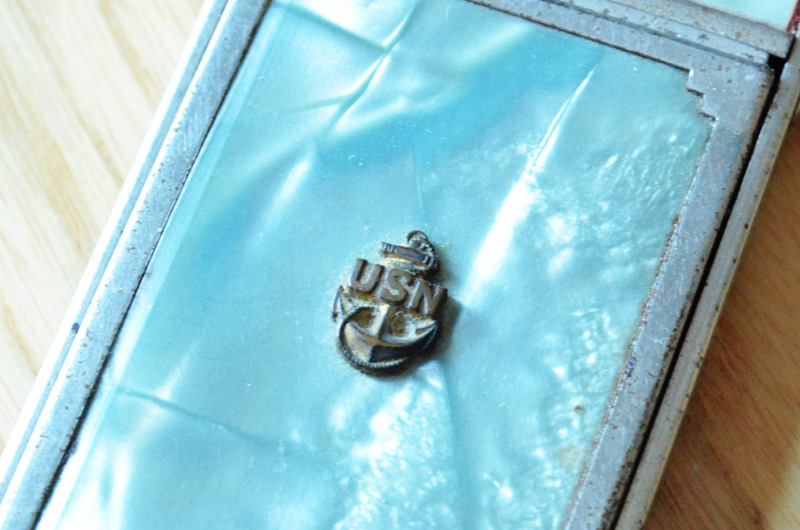 The first thing I noticed was the little anchor and USN on the front, which told me this little lady was probably from the WWII era, but I thought maybe it was something given to the nurses. A little Googling told me these are actually sweetheart compacts, given to the ladies of the navy men serving in the war. They came in all shapes and sizes (some even heart-shaped! ), and with different cosmetics in them. Mine has one for blush and one for powder, and on the end a little compartment pulls out that used to house lipstick! Do any of you have one of these that you either thrifted or inherited from a grandparent maybe? I'm going to try and find some cosmetic inserts that can fit into this one so I can use it. Any ideas on where to look? Ohhhhh. Precious! Mary Kay sells inserts! Oh, excellent tip, Danavee! Thank you! Do you know if the company is cruelty-free? Last I had heard they were cruelty-free until they expanded to China. Something about the Chinese govt not adhering to cruelty-free standards. You might want to check more into this--but that was last I had read! (I'm also interested in these issues--hence the research on my part). 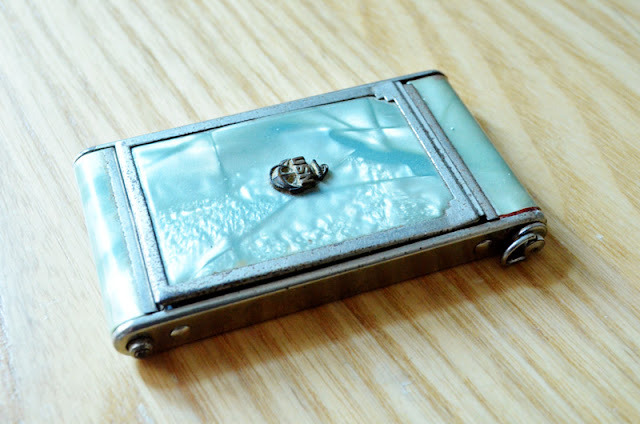 I purchased one from tophatter that is a mirror with a lipstick holder on the outside, and some of the original lipstick still in it. while I don't know the original owner, after doing some research, I discovered that the designer grew up 2 hours south of me in Maine. That connection made it mine! I have no info on inserts though; sorry! That sounds right up my alley! Was the movie good? I own a number of vintage compacts that I have inherited and while "pinteresting" the other day came across an something that might work. They showed how if you dropped your compact and it shattered you could mash it up and put a little rubbing alcohol into it to reset the compact and then let it dry as the alcohol evaporates off. This might work and I am thinking about trying it with mine. It would allow you to use your regular cosmetics without having to find something that you aren't comfortable using and it should fit your budgets. Waste not want not. I would have to imaging to that for the lipstick portion you could free your regular lipstick from it's tube and put it in a piece of wax paper in the freezer. let it set up and then cut it down and insert it in the smaller cleaned out lipstick holder (while it is still frozen) kind of like cookie dough you freeze. It's worth the try. The only think I can't find is replacement puffs. Modern ones are too fluffy and the foam ones I think have a scent on them that I can't get passed. Any ideas on a replacement for those?